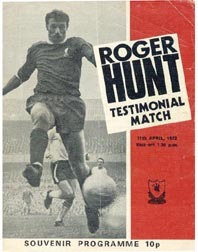 Roger Hunt's testimonial was extra special when you consider that he still managed to draw a capacity crowd despite having been away from Anfield for over two years. Roger left for Bolton in 1969-70 after eleven seasons with Liverpool, but club rules at the time stipulated that players couldn't have a testimonial until they retired from playing. This meant that Roger would have to wait until the end of 1971-2 to be honoured and as such he did not expect a huge turnout. But Kopites never forget a hero and despite a night of torrential rain the gates were locked half an hour before kickoff with an estimated 10,000 still outside. The official attendance of 55,214 was higher than all but one of the league games at Anfield that season and the largest ever recorded for a testimonial in England. They saw Roger hit a hat trick as Liverpool's 1965 FA Cup winning team beat an International XI, comprising many of his team mates from England’s 1966 World Cup winning side, 8-6. 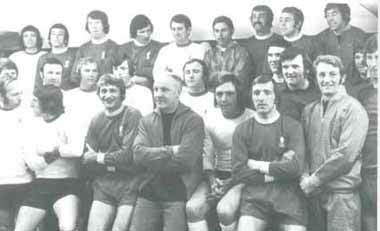 Check out Howard Kendall in the middle of the back row wearing a Liverpool away shirt. Hopefully there's no blues reading this, as they may send the lynch mob after their greatest ever manager! Remember it well!was in the kop with all my mates.hitched a lift to the game from hunts cross,and got the 81 bus home to hunts cross from queens drive after visiting cherry lane chippy for pie and chips,fourteen yrs old,great days! Roger Hunt was always my dad's favourite player until Craig Johnston came along. I've got the 65 Cup Final on DVD, started watching it the other day to do a little research on Chris Lawler for that piece I wrote. Only watched the first half hour or so, but the link up and movement between St John and Hunt was class. Will probably watch the rest of the game in the next couple of days. Quite a challenge to name the players. Would give my age away, but 1970's England World Cup players in there including a young Kevin Keegan! How he was never knighted is a mystery. Sir Roger was my first Liverpool hero. Scored twice on my first visit to Anfield. I was gutted when we moved him on as I was sure he still had a season or two left in him for us. No sentimentality at all in the game in those days - players were only as good as their last game. As you might expect from my user name, Roger was & remains my all-time Reds hero. I remember the testimonial & my dad giving the turnstile operator in the boys pen a dropsy to get in when all the other gates had closed. The average age in the boys pen that night must have been northwards of 30. Ha! I can just picture the boys pen packed with blokes. The fellas on the turnstiles must have made a fortune! I remember Stan Boardman ruining many a testimonial in the 80/90s by running onto the field dressed as a German soldier. Damn, I hated that guy.